Where places to camp with your camper van are concerned New Zealand is chock-full of the fabulous and crammed with the all-to-myself kind; heaped with the low cost or pennies only and even littered liberally with the completely for free. Every taste and every budget, in town centres and in pristine wilderness middle-of-nowhere spots - it is all here on the camp-site menu in New Zealand. In short, it is camper van heaven but how do you go about finding these places? The following is a guide to what kind of thing is on offer and tells you how to go about unearthing the gems. 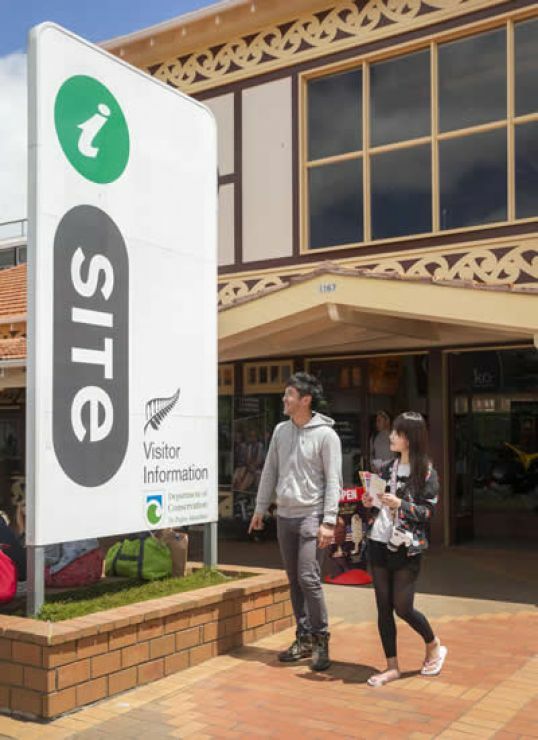 Just a word on names first though – just as flip-flops are jandals and a cool box is a chilly bin, New Zealand also has its own lingo for camp-sites. If you hear the term motor-camp it is just another name for a camp-site. Also, the term 'holiday park' is used here a little differently to some other countries. It could mean a full on holiday complex with all the bells and whistles – which is what you might typically understand the term to mean - or it could just mean a camp-site. Gold mines in general for the traveller, these wonderful tourist information centres are a must-visit for all those heading around New Zealand in a camper. Even tiny communities seem to have an i-SITE so when you rock up to an area or town check out its i-SITE first. They stock all the brochures and publications which list generally the camp-sites options in the area but they will also have flyers, leaflets and even random pieces of home-printed paper with details of local camp-sites which might not be in any of the normal literature. And these are often the gems. It is also worth having a quick chat with one of the folk behind the desk. Local councils will sometimes set aside some land for wild camping (that means free) and the i-SITE staff will be able to give you the low down on this and tell you where to head. AA Guides – another of the pay-to-advertise type publications which means the little gems are unlikely to be found here. However, there are hundreds of listing for camp sites so acts as another great glove-box back up if you get caught out. Rankers are a rather wonderful website; they could almost be described as a one-stop shop for those looking for every kind of place to stay in the country and this includes a whole bit dedicated to camping spots. According to the Rankers folk, the Respect NZ Camping Map displayed on the website contains details of every single camping location in New Zealand and what's more it is endorsed and approved by councils, DOC and park owners. It is the country's most comprehensive database of this kind. Along with the official stuff it also lists hundreds of wild-camp/freedom camping spots. Thanks to some handy tools it is fairly simple to track down exactly what you want. Searches can be defined for example by cost categories - NZ$1-10, NZ$11-20 and NZ$21 upwards – or those which will accept self-contained or non-self-contained units. The Rankers story is quite interesting too – you might want to check that out too. Typically super-modern and often equipped with all kinds of conveniences and facilities you won't find elsewhere, the 40+ Top 10 Holiday Parks are popular and a great choice if you don't want to rough it. Settings are park-like, although sometimes lacking character, and typically speaking you'll find hot showers, drinking water from a tap, electric hook-up, 'phone kiosks, barbecue area, equipped kitchen, washing up sinks, laundry facilities, Internet access, TV room, games room and a dump station as standard with all kinds of stuff as possible extras - tennis courts, swimming pool, bike hire, surfboard hire and spa pools for example. These 4 & 5-star sites don't come cheap though – prices for pitches start at NZ$40 per night - which is why they are often rather more full with holiday-makers than thrifty backpackers. There is a membership scheme available which will save you money if you will be using Top 10s a lot. Kiwi Parks are the campers' equivalent to the BBH hostels. All 49 are individually owned – which typically means tons of variety and individuality – but fall under the umbrella of a network which oversees certain standards. In essence, Kiwi holiday Parks are like the Top 10's grungier – and more economical - little cousin. Usually they are a little more tucked away for starters which in turn can often mean a rather more picturesque setting. As standard you will get toilets, hot showers (sometimes coin operated), a communal kitchen area and laundry. Many, but by no means all will also offer electric hook-up and Internet. Prices begin at around NZ$34 per night for 2 people. There is a membership scheme available which will save you money f you intend to stay at several of these sites. A Kiwi Holiday Parks brochure can be picked up from any i-SITE or Kiwi Holiday Park.